Browse the site by manufacturer from the home page. Use the tagging system (#) to group ads into specific categories. You can see the tags at the top of manufacturer pages in the tag cloud or underneath individual images. 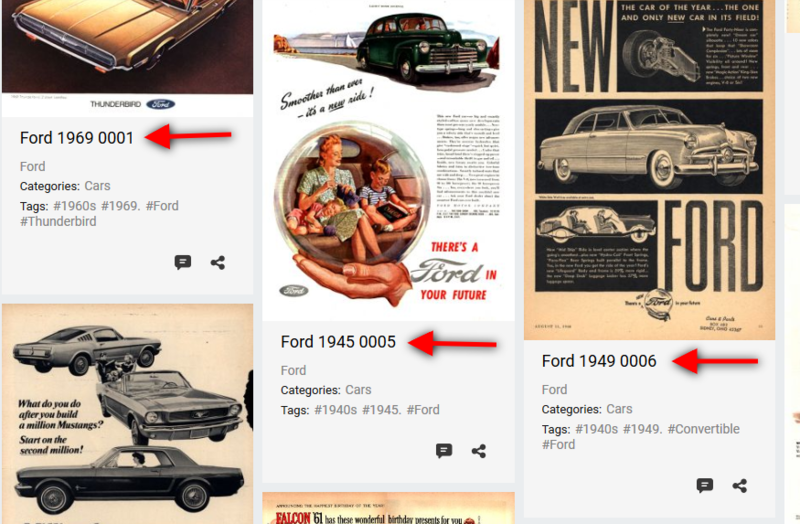 The tags at the tops of the manufacturer pages will only sort those images on that page (all Fords, Chevy’s, etc. ), while the tags underneath the individual images will sort all ads throughout the entire site. There was a lot of help scanning and naming these ads and with 12,000 images to go through mistakes were inevitable. We have found many of these errors ourselves over the course of this project. If you think we have missed or mislabeled an item, please let us know. Let us know why it is wrong so we can verify the correct information, eg. “that year of car didn’t have square headlights” etc. You can report these errors to us by clicking the image and then the comment icon. This will take you to a page to submit a comment. We ask that you tell us your correction and what exactly you think is wrong about the image so we can verify it and correct the issue. With your help we can get this sorted out quickly. When your comment has been received, the correction will be made. There will be NO reply to your comment. Thanks. Do You Have More Ads Than This? Yes, the ads on this site were part of a collection that has been digitized. We still haven’t touched the collection of ads within the AACA Library’s main collection stacks. Once the first collection is finalized on the website, we will move towards filling gaps on the site and add more ads. This will be an evolving process that will continue to grow. If you notice a section that you would like expanded, let us know and we will factor that into what we scan and upload next. Thanks. You can contact us either by email or phone (717) 534-2082 to request a high resolution scan. High Res scans are at 600 dpi and are $1 an image. If you would like a print of an ad, contact us to let us know what size you would like. Prices for Prints: 11” x 14” = $10 + shipping, 18” x 24” = $22 + shipping, 24” x 36” = $36 + shipping. Shipping is a flat $10 which includes a poster tube in addition to the prices below. To request a scan or print copy down the file name of the ad you would like. An example of this is “Ford 1905 0001” where the file name consists of the manufacturer, the date, and then an accession number.